After our tour to the Badaling Great Wall, we travelled for about 45 minutes in the after noon to the Ming Tombs. Located within the suburban Changping District of Beijing, the site is burial place of 13 emperors and 23 queens of Ming Dynasty , as well as many of the princes, concubines and maids. The site, on the southern slope of Tianshou Mountain, enclosed by the mountains in a pristine, quiet valley full of dark earth, tranquil water was chosen based on the principles of feng shui by the third Ming emperor, the Yongle Emperor. According to the fengshui principles, bad spirits and evil winds descending from the North must be deflected; therefore, an arc-shaped valley area at the foot of the mountains was chosen. The Yongle Emperor selected his burial site and created his own mausoleum here, nemed the Changling Tomb. The succeeding twelve emperors had their resting places built around Changling during the next 230 years, covering a total area of over 120 square kilometers. This is the best preserved mausoleum area with the most emperors buried. Known for its trade expansion to the outside world that established cultural ties with the West, the Ming Dynasty is also remembered for its drama, literature and world-renowned porcelain. The Ming Dynasty saw a publishing boom in China, with an avalanche of affordable books being produced for commoners. Reference books were popular, as well as religious tracts, primary school books, Confucian literature and civil service examination guides. It was during the Ming Dynasty that full-length novels began to grow in popularity. Many books were adaptations of ancient story cycles that had been part of oral traditions for centuries. One of the best-loved exports of the Ming Dynasty was its porcelain. The Ming dynasty saw an extraordinary period of innovation in ceramic manufacture. Created by grinding china-stone, mixing it with china-clay and then baking until translucent, the technique was developed during the Tang Dynasty, but perfected in the Ming era. Though various colors might be featured on a piece, the classic Ming porcelain was white and blue. There are so many things said and written about the Great Wall of China, which express the greatness of the Great Wall. It derives fame from the countless works of poetry, folk literature, theater, movies and stories written about it by rulers, soldiers, literati, artists and poets. Even the famous writer Franz Kafka wrote a short story in 1917 about the Great Wall. In his style, he questioned why did the emperor order the construction of the wall, against whom was the wall to provide protection, and why did emperor instructed the wall to be built in sections, rather than continuous ? He wrote that the wall was built to protect the people from the people of the north, although there was no real threat from people of the north. The north people are decribed as devils, pictured with their mouths flung open, the sharp pointed teeth stuck in their jaws, their straining eyes, which seem to be squinting for someone to seize, whom their jaws will crush and rip to pieces. When children are naughty, the parents hold up these pictures in front of them, and they immediately burst into tears and run into their parents. The chinese people know nothing else about the northern lands. They have never seen them, and if they remain in their village, they never will see the people of north. So, Kafka suggested that the construction of this magnificent Great Wall was based on rumor to create fear of a false enemy. Written in 1917, Kafka would have known that the people of north, the Monggols, the Manchurians, did attack the Chinese several times. But the attacks happened hundreds of years later and Kafka wasn’t writing about history, he was writing how the people followed the instruction of the emperor although it didn’t make sense. He wrote that they didn’t understand the enemy from the north and didn’t understand why the emperor instructed the wall to be constructed in sections, leaving gaps in the wall that could be used by enemies to penetrate into their country. They didn’t understand it, they just followed the instruction from the emperor, or so they believed. Kafka wrote that they didn’t even know who was the reigning emperor, they only knew those emperors that had been long dead! Kafka was writing about the absurdity surrounding the construction of the Great Wall. Actually later on in 221BC Emperor Qin Shi Huang commanded the linking of the separate sections of the walls built by previous states. After unifying central China and establishing the Qin Dynasty the Emperor wanted to consolidate his power and rule the country forever. He sent a fortune teller named Lu Sheng to seek for a way of immortality. After countless empty-handed returns, Lu finally brought back a rumor that Qin would be overturned by the northern nomads. Hearing that, the Emperor was so frightened that he immediately issued an order to connect the walls and extend new ramparts to guard the northern border. It is surprising to know that the decision for this huge project was made due to a rumor! Emperor Qin Shi Huang, the first Emperor of China, is often referred as the initiator of the Great Wall. Several walls were being built as early as the 7th century BC; these, later joined together and made bigger and stronger by Emperor Qin Shi Huang , are collectively referred to as the Great Wall. His public works projects included a massive new national road system, as well as the city-sized mausoleum guarded by thousands of the life-sized Terracotta Army. He ruled until his death in 210 BC during his tour of Eastern China. Historically, hundred os years later there were several major attacks by the Mongols and the Manchurians. In 1554, the Mongols used ropes to climb the walls. Chinese repelled them using arrows, crude cannons, clubs and even rocks. Although a useful deterrent against raids, at several points throughout its history the Great Wall failed to stop enemies. In 1576 there was another major Mongol attack. This time they penetrated through an area so rugged and remote building a wall was not considered necessary. During this raid the Mongols killed an estimated 20,000 Chinese. In 1644 the Manchurians under Qing dynasty marched through the gates of Shanhai Pass and replaced the most ardent of the wall-building dynasties, the Ming, as rulers of China. The Great Wall of China visible today largely dates from the Ming dynasty, as they rebuilt much of the wall in stone and brick, often extending its line through challenging terrain. Some sections remain in relatively good condition or have been renovated, while others have been damaged or destroyed for ideological reasons, deconstructed for their building materials, or lost due to the ravages of time. For long an object of fascination for foreigners, the wall is now a revered national symbol and a popular tourist destination. The Badaling Great Wall near Zhangjiakou is the most famous stretch of the Wall, for this is the first section to be opened to the public in China, as well as the showpiece stretch for foreign dignitaries. From the outside, the Forbidden City doesn’t look impressive, it looks like a fortress or a prison due to the high red coloured walls surrounding the palace. Actually, indeed the walls in the past were there to protect the Emperors from outside world, or in the case of Pu Yi, The Last Emperor, the walls isolated or imprisoned him in the Forbidden City (read also previous blog about Pu Yi). Coming inside, it is like a completely different world, large halls, large courtyards, large gates, large space, too large to be a palace or a prison for an emperor. There are halls after halls connected with other halls through stairways, gates , bridges and courtyards. It is an impressive example of city planning that is carried out on a huge scale yet is balanced, harmonious, graceful, and beautiful. Chinese people believe in an essential unity between the universe, humanity, and nature. The Forbidden City, was created according to these principles of benevolence, harmony, balance and stability. All of these principles represent the essence and core of Confucian thought. The design and its layout followed the ideal cosmic order in Confucian ideology considering the Forbidden City as a ceremonial, ritual and living space. The lay-out considered that all activities within the city were conducted in the manner appropriate to the participants’ social and familial roles. All activities, such as imperial court ceremonies or rituals, would take place in dedicated palaces depending on the events. The unforgettable colossal scene from the movie “The Last Emperor” by Bernardo Bertolucci, the coronation of the 3 year old Emperor Pu Yi, took place in the Hall of Supreme Harmony. After the imperial seal was imprinted on the proclamation, wearing a small yellow imperial dragon robe, Pu Yi went out of the hall and looked into the huge courtyard beyond. Thousands of government officials and palace servants are arranged in ranks in the courtyard and in the square beyond. To rhythmic chants and commands, they all kowtow to the new emperor in a series of prostrations. The Hall of Supreme Harmony, where the coronation of Pu Yi and other important ceremonies took place, is the highest and largest building in the whole city. Behind it is the Hall of Central Harmony, which is smaller and once served as the lounge for the emperor ready to hold the ceremony or be enthroned inside the Hall of Supreme Harmony. Behind this hall is the Hall of Preserving Harmony, it was used for formal functions too, and where students past various studies and examinations in the Qing Dynasty. Keep walking forward from the Hall of Preserving Harmony and through the Gate of Heavenly Purity, and you will enter the inner court. The inner court was the family residence of the emperor and was not open to the officials or civilians of that time. The three most important palaces are located in the inner court, named The Palace of Heavenly Purity, The Hall of Union and The Palace of Earthly Tranquility. The Palace of Heavenly Purity was built as the emperor's principal residence, where emperors slept and worked. Beginning in the Emperor Yongzheng reign, this palace was no longer a residence. The nearby Hall of Mental Cultivation took over that function. However, it was still a venue for emperors to conduct routine government business and celebrated major festivals and rituals. The Palace of Earthly Tranquility is the residence of the Empress, and she held ceremonies here on the major festivals and celebrations receiving tributes. Since the reign of Emperor Qianlong, the hall was used to keep twenty-five imperial seals, each of which was designed for a certain purpose. These seals are laid in boxes which were covered with yellow silk as what they were. The Hall of Union symbolizes the the union of the heaven and the earth which bring peace forth. The hall is square in shape with a pyramidal roof. Stored here are the 25 Imperial Seals of the Qing dynasty, as well as other ceremonial items, including the clocks that set the official time in the palace. The impression depicted by the movie “The Last Emperor” by Bernardo Bertolucci about Pu Yi’s childhood was that of a playful, cute, and innocent boy, although a bit naughty like any other boy of his age. A three year old boy who suddenly became the Emperor of China, leaving his parents and siblings to be isolated within the walls of the Forbidden City, served by the eunuchs loyal to him. The boy who still liked to play outside was appointed to be the emperor of this great country. Imagine that! This impression stuck in my mind until I met Pu Yi for a conversation at the Salt Tax Palace, his exile in Manchuria. When I met him as an adult the impression I got about the boy depicted by the movie suddenly disappeared. Off course, his childhood history is only a beautiful memory of his past which is a small part of his dramatic life. His face pale, looked tired dan didn’t like to talk. He had a fixed stare behind his black-framed glasses. When we were introduced, he responded with a friendly nod. But his smile lasted only a second. “It was this tiny world where I was to spent the most absurd childhood possible until I was driven out by the National Army in 1924. I called it absurd bacuse at a time when China was called a republic and when time that mankind had advanced into the 20th century I was still living the life of an emperor, breathing the dust of the 19th century. Whenever I think of my childhood my head fills with a yellow mist. The glaced tiles were yellow, my sedna-chair was yellow, my chair cushions were yellow, the lining of my hats and clothes were yellow, the girdle round my waist was yellow, the dishes and bowls from which I ate and drank were yellow, the padded cover of the rice-gruel sauce pan, the material in which by books were covered, the window curtains, the bridle of my horse.. everything was yellow. This color, the so called “briliant yellow”, was used exclusively by the imperial household and made me feel from my earliest years that I was unique and had a “heavenly” nature different from that of everybody else. “Wherever I went, grown men would kneel down in a ritual kowtow, averting their eyes until I passed. The Emperor was Divine. I could not be remonstrated with, or punished. Flogging eunuchs was part of my daily routine. My cruelty and love of wielding power were already too firmly set for persuasion to have any effect on me. “They are basically all thieves, everyone, from the highest to the lowest. 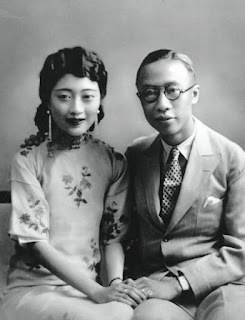 I found that by the end of my wedding ceremony, the pearls and jade in the empress's crown had been stolen. Locks were broken, areas ransacked, and on 27 June 1923, a fire destroyed the area around the Palace of Established Happiness. I suspected that the arson were caused by the eunuchs as they tried to cover up the extent of their theft. “ I admit that I also like to buy Western goods, especially Wrigley's chewing gum, Bayer aspirin, cars, gramophone and movies. I like the new technology of cinema, I was so delighted with the movies, especially Harold Lloyd films, that I had a film projector installed in the Forbidden City despite the opposition of the eunuchs who disliked foreign technology in the Forbidden City. This is an imaginary interview in memory of Pu Yi, The Last Emperor. Source: Authobiography “From Emperor to Citizen”, South China Morning Post, Wikipedia.